It has been a busy time at Brick technology recently as we have been working hard on perfecting three new websites, each featuring state-of-the-art mobile web design! All three are now live and running smoothly and we will be welcoming them individually over the next couple of weeks. First we would like to offer congra­tula­tions to Terberg Fire & Rescue, with whom we have been working for some time. The company, which provides a professional array of fire vehicles and fire fighting equipment, have decided to place their web presence firmly in the limelight with a complete upgrade to the very latest that Brick technology has to offer. An extremely important change for Terberg is their new domain name - terber­gfi­re­an­drescue.­co.­uk. This new URL is much more repre­sen­tative of the company and beats their old web address - firevehicle.­co.­uk - by a long way, making visitors feel more secure. 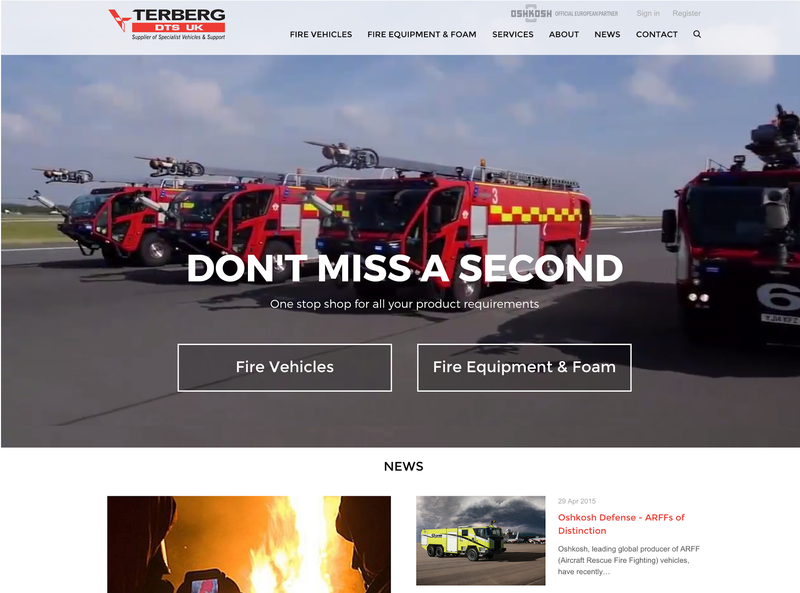 Terberg’s new homepage is designed to be eye catching, featuring embedded HD video showing the company’s professional fire fighting equipment in action. From the moment of access, it becomes clear that Terberg are a modern, dynamic organisation with a dedication to quality at every level. Responsive, adaptive web design means that customers wishing to access the new Terberg website from a smartphone or tablet can now do so without restriction. Every element of the website is designed to work perfectly whether accessed in this way or through the more traditional route of laptop or PC, meaning that the Terberg experience is seamless throughout. It is said that a picture is worth a thousand words and old-style menus have been replaced with illustrated options, giving the entire website a uniquely-professional feel. Simply pointing at a menu option reveals related HD images for that section, encouraging visitors to explore further and holding their attention for longer. Brick technology web design Lancashire are extremely proud of the new Terberg Fire & Rescue website and invite you to view it here. After experiencing the sleek modernity for yourself, call our web development Lancashire team on 01254 277 190 and find out how we can revolutionise your ecommerce website.